Every cyclist and triathlete has a slight imbalance in power output. For some, the imbalance is enough to negatively impact their performance. When this occurs, a biomechanical screening and change in bike position and equipment can help. However, beyond the simple parameter of feel, how can a coach or athlete determine if the changes made are effective? By using data both before the changes and after, we can see the changes in power balance and output, both in the lab and out on the road. This data can confirm that the new position is working, or show that different changes may be necessary. Most power meters give us the opportunity to analyze how our legs are working and check possible asymmetries, which limit our efficiency and increase the risk of injuries. WKO4 takes it even further and provides details of the power balance during a workout. When we discover an imbalance of more than 3 percent a biomechanical screening is needed. In the following images, we can see this cyclist is working with an imbalance of 46/54 percent. There is a net power of 73 watts from the left leg and 94 watts from the right. The scatter plot shows the pedaling balance at differents watts and in most cases the right leg is above the left. To do a deeper analysis, we can use the Mean Max Gross Power Curve to see how the cyclist manages force over the pedals. In this case we can see how Gross Power Releases (GPR) for the right leg is higher than GPR for the left. We also can see that Gross Power Absorbed (GPA) for the left is sometimes higher than GPA for the right. All of this is a consequence of the asymmetry. This cyclist experienced pain in the pyramidalis and left hamstring muscles because they were so tight. After this analysis, the cyclist was told to set up a biomechanical screening in order to solve the asymmetry. In the lab, after the changes, the cyclist recorded some time pedaling, and we took this data back into WKO4 for analysis. The power balance improved from 46/54 to 48/52, and the net power realized from both legs was more equal. GPR left and right were now almost symmetrical. There was still more GPA on the left than the right, which can be explain by the motor pattern; the cyclist tends to pull up more with the left leg because of his previous asymmetry. Our next task is to improve his pedaling technique to pull more equally with both legs. After making changes in the lab, it is important to transfer what we’ve learned to the road. In this case, our athlete now has three hours of workouts with a balance of 48/52 and similar net power from both legs (103 and 101). We hope that with continued technique improvement and strengthening of the psoas, this cyclist can soon achieve a 50/50 balance. 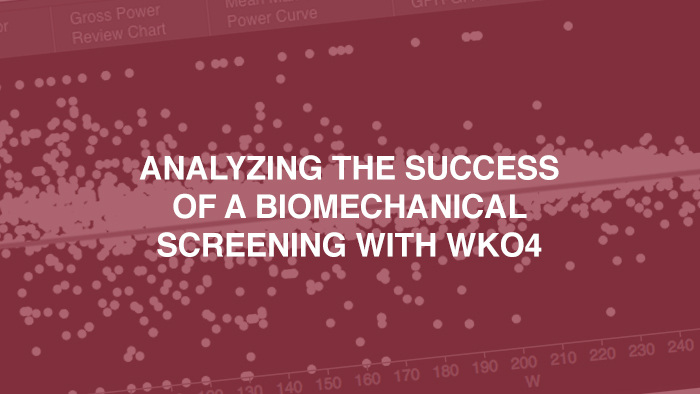 WKO4 is a powerful tool when it comes to analyzing power balance to prevent injuries and improving efficiency. It also helps coaches and athletes see how changes in position and equipment have direct effects in the ability to pedal effectively and efficiently. Jon and Javier are cycling insiders who are curious about complex explanations for apparently simple problems. Jon is CEO of Custom4.us and works for World Tour Lotto Jumbo, and Javier is CEO of and works for Custom4.us.